If markets are conversations then the new London flagship store is a perfect example of this. With a wink at Twitter to represent the global colour sentiment Benetton, thanks to an advanced digital asset management, displays in its windows a LED wall that draws in real time from the #colour. 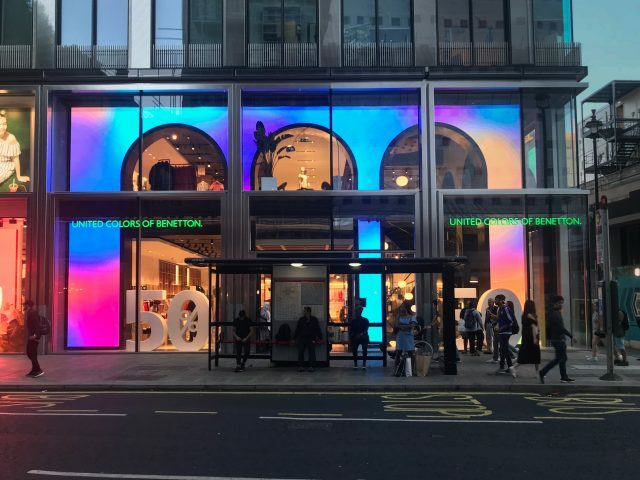 Digital & Design represent a lasting combination for the Benetton brand, that has redesigned the relationship between shop and shop window, thus creating an interesting architectural dialogue in the famous Oxford Street in London. Combining neoclassicism and futuristic design the building, host to the most multilingual rainbow ecosystem of prêt-à-porter collections, consists of a glass and steel structure in which is inserted an angular high resolution LED wall. The structure consists of 5 soaring and iridescent arches, 8 meters in height and covering 25 meters of street front. Once again the brand has surpassed itself, confirming its ability to find an innovative use for digital signage. The aim was not just to set up a monumental and spectacular structure, but also to represent a new aspect of the people experience. If it is true that markets are conversations, to paraphrase the Cluetrain Manifesto, then Benetton interprets its colour sentiment giving it a new aesthetic significance. Thanks to a special program the digital structure of the LED wall interfaces with Twitter to draw on all the #colour of the planet, relaying them in real time through a dynamic and luminescent colour gradient. So, from the windows of the London flagship store it is possible to observe the most important moments of global conversations in which colours, from Black Friday to Red Day, take centre stage. The system has been developed by Fabrica, the communication research centre of the Benetton Group. The application filters in real time all the Tweets sent worldwide, and any hashtag with a colour in it is captured and reprocessed using a series of patterns. In this way the shop windows represent the colours of a global conversation broadcast by the LED wall 24/7. Thanks to a system that regulates automatically the daylight intensity, Benetton’s windows become the trademark of a social experience narrated by a company that has definitely a great experience of colours. The design, development and installation are all strictly made in Italy. M-Cube Digital Engagement, long standing partner of Benetton in the Digital Signage sector, has designed the Led wall structure, and has also integrated in the Content Management the application that, through a special algorithm, enables all the #colour to adapt to the digital palette in such an attractive way. While Benetton decides the schedule and the criteria of content distribution, M-Cube manages the digital content management, coordinating the communication in over 200 stores in 25 out of the 100 countries worldwide in which Benetton is present. And so the digital & design content shines brightly in Oxford Street, telling of an era of great changes and big innovations. The demanding, sophisticated, and leading London market represents a real challenge for Benetton. Its new flagship store is located at the crossroads that soon will become a strategic point in Oxford Street. In front of the store the Tottenham Court Road tube station will soon become one of the major stops of the new Elizabeth line, that connects Heathrow with central London. There are also plans for a complete restyling of Oxford Street, including a reduction in traffic and the widening of the side walks, to turn it into a pedestrian friendly shopping street. The aim of the council, in fact, is to transform it into the most important and prestigious commercial street in the world. By mixing Digital & Design in its London flagship store, the brand is not only aiming at creating an unforgettable concept, but also to experiment and study the new touch points of relationship and interaction with the consumers.The store occupies two floors, and the interiors’ elegance and harmony reflect the coordinated image of Benetton. In addition the Digital & Design combination has turned the store into a veritable experimentation and development lab. The check-out time has been speeded up with the introduction of mobile POS in place of the traditional system, and a new click and collect service is in place to satisfy the pervasive omnichannel trend of the customers. M-Cube has also created the touch table which enable the customers, thanks to the smart RFID labels on selected items, to interact with these products and to get more information about them on the smart desk display. Benetton has got into the habit of amazing its customers, and will continue to do so thanks to its great visionary spirit.